As an avid reader of crime fiction, I picked up Heist and read the blurb: an inauspicious start I thought, but enough to get me to start reading. From the first I could see this as a movie. The settings lend themselves to the action movie, and it was easy to see how this book will translate – I hope Robert Schofield gets the chance to profit. The gold room at the mine, the outback roads, Kalgoorlie’s race round, and its colourful Hay Street contrast well with the suburbs of Perth. I found that I read it quickly and it kept me interested, and while there were a couple of places where I asked myself questions about local facts or places, I did not find the errors I have sometimes found in other books set in places with which I am familiar. The action was plausible, although at times just stretching the margins of possibility, I found myself caught up in Gareth Ford’s urgent need to get to Perth to ensure the safety of his daughter and ex-wife. The police, Kavanagh and the others, including Detective Inspector Chadwick, the bikies, the Vipers and their associates, and the other characters all lend themselves well to the story. I began to suspect the what might happen in the end, but was not sure enough to give up reading, and certainly the momentum and the plot were not lost in this growing suspicion. Schofield describes aspects of Perth in ways which I had not thought about before, and yet he is able to evoke in me memories of places I have been in such a way that they felt familiar. His prose style is colloquial and easy to read, while at the same time containing an air of sophistication sometimes lacking in action style crime novels. Heist is a crime novel, but it is not a detective novel or police procedural, and the action associated with the crime as the protagonist tries to work out what is going on, and who to trust, made it well worth the read. I wonder what book Schofield has in the pipeline for me to read next. Wow! What a talented mother & daughter team you are Megan and Emily. It's wonderful to see a shared passion of reading. Reading crime novels seems like a good way to wind down, or escape for awhile. 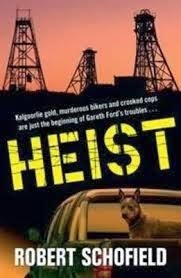 Look forward to reading Heist which is on my reading list. Thanks for the great post Emily. I agree with your mums assessment, this was an enjoyable read for me too!